Digital devices, television screens, computer screens, tablets, laptops, cell phones, LED screens… Most of us spend more time staring at a digital screen than we realize. In fact, studies suggest that 60% of people spend more than 6 hours a day staring at some kind of digital device. “It’s not actually the device that is the problem,” explains Leanne O’Neil, Owner of INDY Neurofeedback, “it’s the artificial blue light coming from the device.” Blue light is one of the shortest, highest-energy wavelengths (the shorter the wavelength; the higher the energy.) Because they are shorter, these blue or High Energy Visible (HEV) wavelengths flicker more easily than longer, weaker wavelengths. This kind of flickering creates a glare that can reduce visual contrast and affect sharpness and clarity. This flickering and glaring may be one reason for the eyestrain, headaches, physical and mental fatigue caused by many hours sitting in front of a computer screen or other electronic device. Studies suggest that, over time, exposure to the higher energy of blue light may cause serious long-term damage to your eyes — and your brain. There’s growing medical evidence that blue light exposure may cause permanent eye damage, contribute to the destruction of the cells in the center of the retina, and play a role in causing age-related macular degeneration, which can lead to vision loss. It also negatively affects the brain. What happens to your brain on blue light? Researchers have suggested that there is a specific neural pathway from the eyes to the brain—separate from how vision is transmitted—that ultimately causes blue light wavelengths to worsen headache pain and other symptoms. 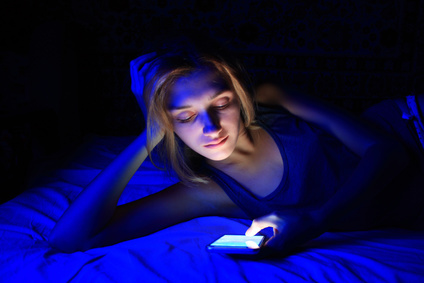 Overexposure to blue light can lead to intense headaches, a greater perception of pain and throbbing and even enhanced spreading of headache pain across the brain. Intense headaches can also include aura symptoms, photophobia and light sensitivity, dizziness/nausea, and more. Try “blue blocker” (blue-light) filtering glasses. Warm the light settings on your devices by switching to “night mode” to make it easier on your eyes. Turn your phone or computer off at least 2-3 hours before you go to bed. Change your light bulbs to warmer tones and colors. Opt for more natural light if possible and avoid/remove fluorescents, if appropriate. Give your eyes a break.Look away from your screen at least once every 20 minutes to let your eyes reset. At INDY Neurofeedback, we know that keeping your brain in peak condition requires attention to diet, exercise, sleep, and yes – even what your eyes do during your waking hours. Here’s to your overall health!